As the investigation into the Trump campaign’s contacts with Russian intelligence services heats up, the White House has launched what appears to be a concerted effort to minimize the role that Paul Manafort—the former Trump campaign chairman with a long history of ties to allies of Russian president Vladimir Putin—played in Trump’s victory. Last month, Trump told a reporter that Manafort “was replaced long before the election.... He was only there for a short period of time.” Just yesterday, press secretary Sean Spicer went even further, preposterously claiming that Manafort had only a short and “very limited” role in the campaign. But previously unreported text messages allegedly hacked from a phone belonging to Manafort’s daughter appear to contradict that spin, and suggest that Manafort remained “very much involved” with the Trump operation even after his resignation in August. But to intimate that somebody who was there for eight weeks, and definitely not there in the final three months of the campaign played some kind of lasting role that influenced — you know, again, you realize, I think somewhere between March — I mean, August 12th or the 15th was when he ended his affiliation with the campaign. So my point is, to suggest now that if you look at the final three months of the campaign where none of the individuals in question that Democrats brought up over and over again today were affiliated with the campaign — to suggest that that somehow shows some high-level collusion is a bit of a stretch to say the least. There are several problems with Spicer’s version of events. The first being that, even by official accounts, Manafort spent considerably more than eight weeks as a member of the Trump campaign. As CNN notes, Manafort was first hired at the end of March to help with Trump’s delegate-counting effort ahead of the RNC. Then in May, a soon-to-be-fired Corey Lewandowski was given diminished powers as Manafort snagged the role of campaign chairman and chief strategist. It wasn’t until August 19 that Manafort finally resigned amid a number of investigations questioning his ties to Russian interests in the Ukraine. Manafort continues to deny the allegations. That puts Manafort’s stint with the campaign at a solid four months, at least according to what’s been made public. 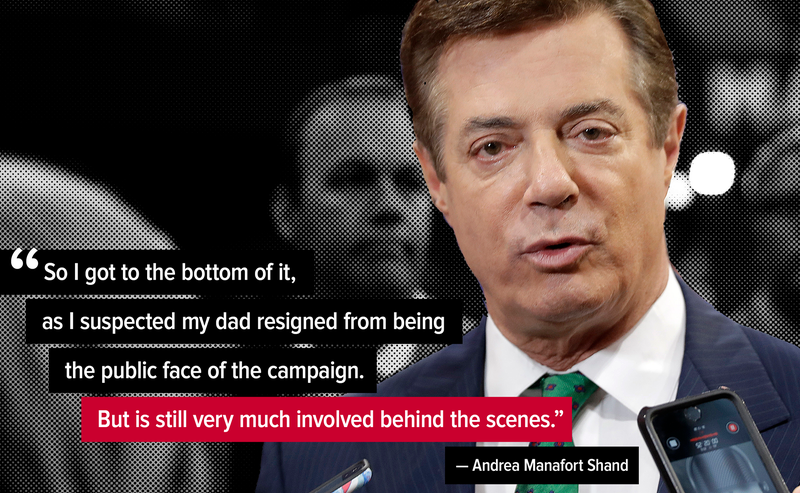 But according to leaked texts allegedly hacked from the phone of his daughter Andrea Manafort Shand, Manafort’s resignation was all for show, and he continued to wield influence in the campaign. The very next day, Eric Trump went on Fox News to hit on a similar talking point, saying, “I think my father didn’t want to be, you know, distracted by whatever things Paul was dealing with. You know, Paul was amazing. But again, my father just didn’t want to have the distraction looming over the campaign....” Eric, of course, did not mention any sort of continued role. Manafort Shand is a 31-year-old lawyer living in Washington, D.C. The texts allegedly stolen from her phone appear to have been first discovered on the darknet by the blog Krypt3ia on February 16. A week later, Politico reported on an alleged attempt to blackmail Manafort by Ukrainian politician Serhiy Leshchenko, who had allegedly texted Manafort’s daughter in an effort to contact Manafort himself. While Leshchenko decried the texts as “obviously fake,” Paul Manafort confirmed to Politico that his daughter had been hacked, and verified the authenticity of at least some of the texts (he declined to comment on the rest). The leaked data file, which was acquired by Jezebel, contains over 280,000 text messages sent between October 2012 and September 2016 and appears to have been taken from an iCloud backup of Manfort Shand’s iPhone. At the time of publication, Andrea Manafort, Paul Manafort, and the White House all have not returned our requests for comment. We will update if and when we hear back. In the meantime, if you have information about Paul Manafort or anything else related to the Trump administration, you can let us know here.